I'm packed and ready to be picked up for my ride to the airport. My plane leaves today at 4 pm but I won't arrive in Virginia until 10 pm. There's a stopover in Philadeplphia so I've packed snacks and writing materials. I can't wait to see my family but I know I won't be ready for the freezing temperatures. I've said goodbye to the stray cats (my friend Brigitte will be feeding them while I'm away) and I hope they'll be ok. I guess it's fitting for someone who lives in a tropical climate to vacation somewhere where the temperatures are below freezing. Have a wonderful Christmas everyone. I'll be back in South Beach before the New Year. Looking forward to 2010 as the year my book SOUTH BEACH STAR is published. 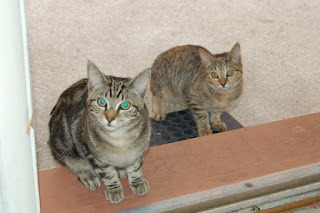 PHOTO: Stray cats saying goodbye (actually they're waiting for food).